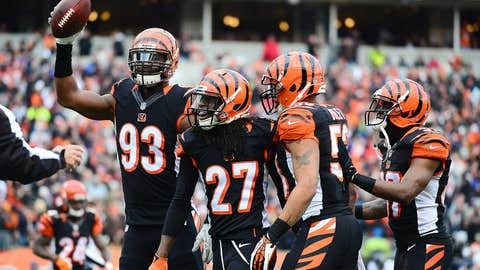 Bengals cornerback Dre Kirkpatrick celebrates with teammates after intercepting a pass during the fourth quarter against the Baltimore Ravens at Paul Brown Stadium. CINCINNATI (AP) — The preliminaries are over for the AFC North champions. The Bengals know their season will be judged almost entirely on what happens in the next game. Andy Dalton threw for two touchdowns, ran for another and set a couple of club passing records Sunday in a 34-17 victory that eliminated the defending Super Bowl champion Baltimore Ravens. The Bengals (11-5) have been focused on the playoffs since long before the opening game. They got bounced from the postseason in the first round each of the last two seasons, losing in Houston both times. Cincinnati hasn’t won a playoff game since 1990, tied for the seventh-longest streak of futility in NFL history. The Bengals will host the Chargers next weekend at Paul Brown Stadium, where they’re 8-0 this season. They beat the Chargers 17-10 in San Diego on Dec. 1. "I feel really good going into the playoffs this time," safety Chris Crocker said. "Different team, different type of feeling. We have the momentum, and that’s the big thing. And we play at home." The Ravens (8-8) aren’t used to heading into the offseason so early. They were the only team to reach the playoffs each of the last five seasons. This one ended with back-to-back losses, and quarterback Joe Flacco playing despite a sprained ligament in his left knee. "It’s tough," Flacco said. "It’s disappointing. But we’re an 8-8 football team. We don’t deserve to be there." Flacco threw for a career-high 3,912 yards but also had 22 interceptions this season. He said after the game his injury will heal without surgery. There will be plenty of time for healing. "Not going to the playoffs hurts," running back Ray Rice said. "I’m not used to having this kind of time on my hands." COULDN’T BE MORE PERFECT: The Bengals are a different team at home, where they’ve scored 49, 41, 42, 42 and 34 points in their last five games. They went 8-0 at home for the second time in franchise history. The other time was 1988, when they also won two home playoff games on their way to their second Super Bowl loss to San Francisco. They’re guaranteed only one home game this time, but it puts them in good position to break that playoff drought. They ran for 164 yards while beating the Chargers in San Diego a month ago. 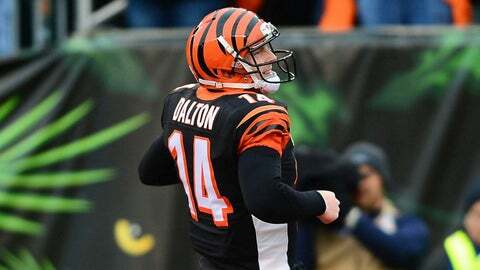 DALTON’S RESILIENCE: One of his best traits is his ability to overcome big mistakes. Dalton threw four interceptions Sunday, matching his career high, but also threw for two touchdowns and ran for another. He finished one of the finest regular seasons by a Bengals quarterback, breaking Carson Palmer’s club records with 33 touchdown passes and 4,296 yards. ABOUT THAT PLAYOFF DROUGHT: The Bengals are 0-4 in the playoffs under coach Marvin Lewis, who is in his 11th season. They’re tied with the New York Giants (1959-80) and Los Angeles Rams (1952-73) for the seventh-longest drought in the playoffs. "This is the time," Dalton said. "What you’ve done in the regular season doesn’t matter anymore. It’s all about what you’re doing now." TOUGH TO REPEAT: The Ravens became the 15th Super Bowl champion that failed to reach the playoffs the following season, and the sixth in the last 12 years. Those Super Bowl swoons are tough to avoid. The Ravens had a lot of turnover on defense, and the offense was inconsistent all season. "We’re the champions," cornerback Lardarius Webb said. "The targets were on our backs. Everybody was coming to knock down the world champions." A LOT TO FIX: The Ravens couldn’t run the ball consistently all season, creating major problems. Baltimore was one of the worst teams at scoring touchdowns from inside the opponent’s 20-yard line, an issue that showed up again Sunday. The Ravens managed only three field goals off Dalton’s first three interceptions. Justin Tucker set a club record with 38 field goals.